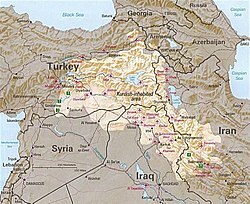 Kurdistan is a mountainous area in the Middle East, that is mainly inhabited by Kurds. The Kurdish people is estimated to be around 35-40 million people. In Iranian Kurdistan, the cities of Piranshahr & Mahabad are the two main cities of Mokrian district. This page was last changed on 17 January 2019, at 00:28.